I made this for Shabbat last week and got many compliments. It is fast, easy and of course healthy and delicious! * Note: any veggies would work here, especially those that are going bad in the fridge. Combine all ingredients in a large bowl. In a smaller bowl mix all spices together (you should get a paste consistency), pour over fish and veggies and rub everything with your hands. After everything is well mixed separate the fish and veggies. 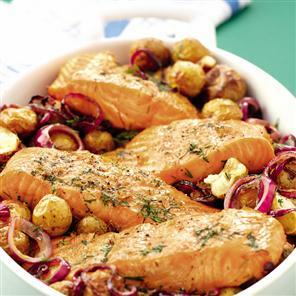 In a deep baking dish arrange the veggies first and on top the fish. Bake covered for 40 minutes.